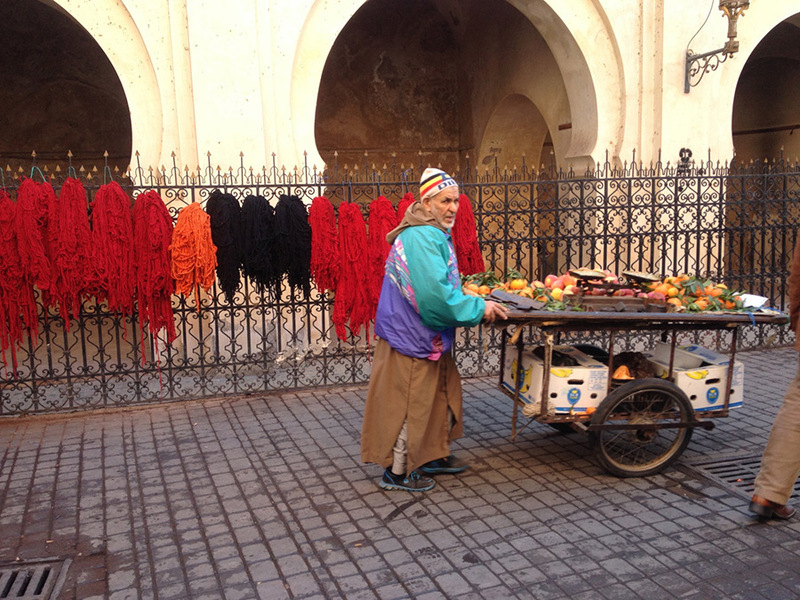 This year I spent Christmas in Marrakech, staying in a traditional riad the heart of the medina – the old city. 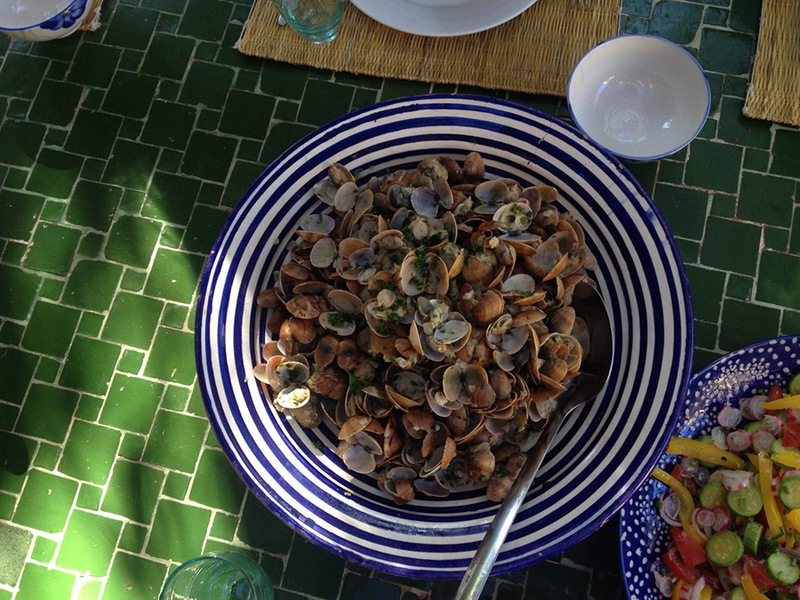 Our friends and hosts were great cooks and enthusiastic entertainers and the next few days would be a celebration of Morocco’s extraordinary and exotic food. 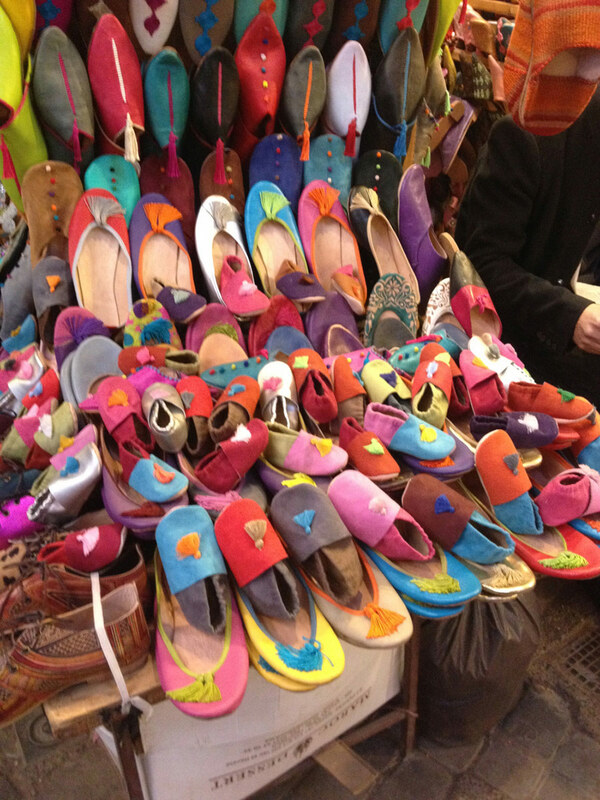 Outside the thick, clay walls of the riad, a tangle of narrow alleys led onto the main square, Djemaa el Fna, where the hawkers, market stalls and performers tempt, hassle and entertain. 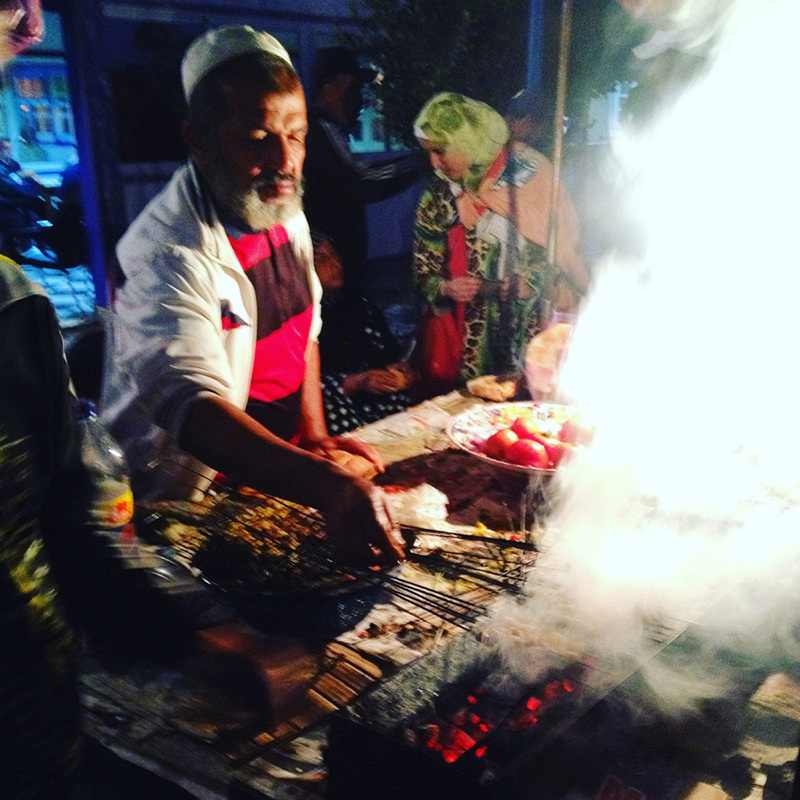 At night, rows of street food vendors cook Moroccan delicacies over burning coals, and the air is filled with smoke and the scent of spices. Riads are designed with a central courtyard or internal garden, usually on the ground floor, with rooms over two or three stories, all facing into the central space. 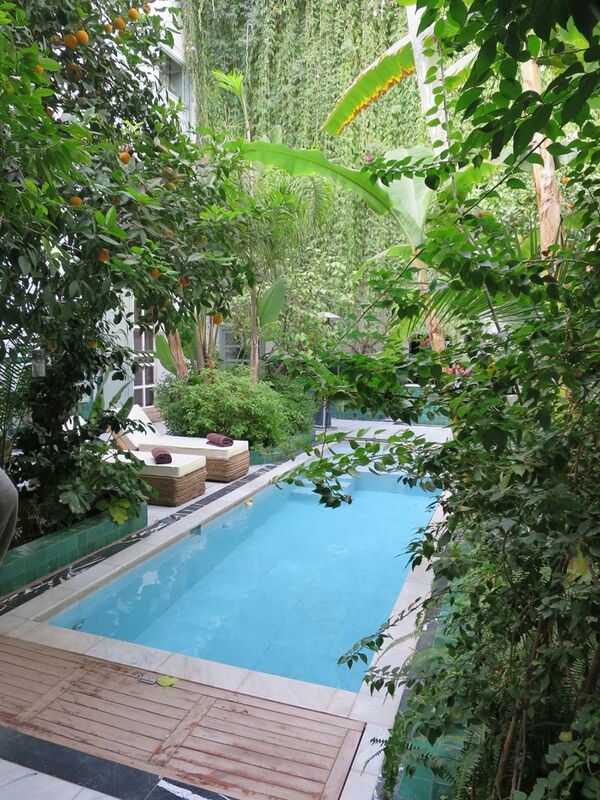 Our courtyard was full of lush green palms and orange trees, laden with fruit, surrounding a pool of water. A steep staircase led onto the roof terrace where we ate breakfast, looking out over the tightly packed houses of the medina and the towers of mosques reaching into the sky. In the distance, the Atlas Mountains loomed like huge clouds. 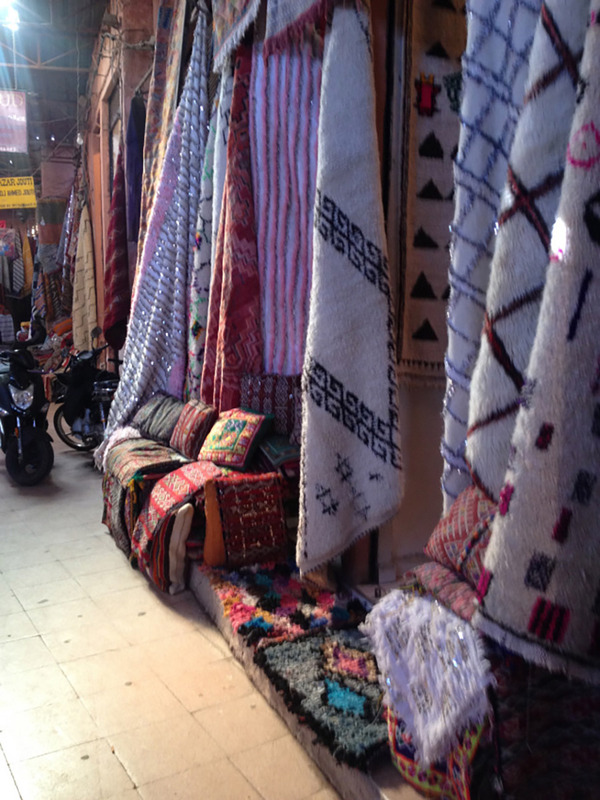 The medina is home to main souk, where tourists flock to haggle over Berber carpets, leather bags, djellabas and Moroccan slippers. Beyond the souk lies the Mellah, (the meat and vegetable market in the old Jewish quarter), where we headed to buy ingredients for Christmas festivities and feasting. Squeezing down the narrow alley leading into the market, lined with cages filled with chickens and tiny chicks, squawking and flapping; we wrapped our scarves over our faces to filter the stench and pushed further in, past huge slabs of beef, bright red and freshly cut. Beyond the meat section (which even I found challenging), it was a relief to reach the vegetable and grocery stalls. Winter vegetables – turnips, cabbages, cauliflower, potatoes and other roots – were piled high alongside fennel with cascading green stalks, baby aubergines, swathes of herbs, scarlet pomegranates and bright citrus fruit. The displays of La Perle d’Olive immediately caught my eye. 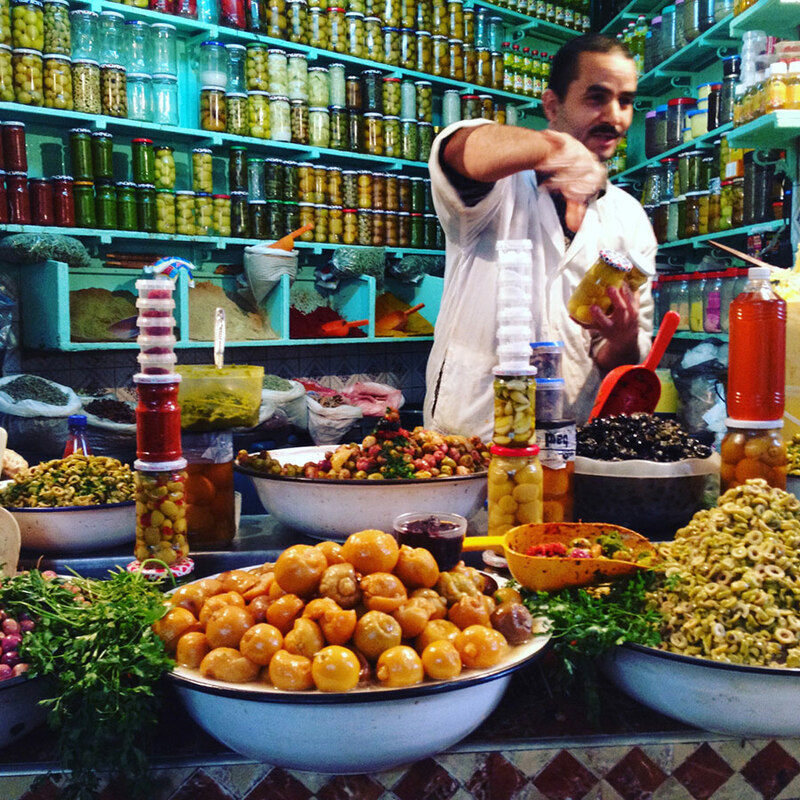 A colourful stall selling preserves: confit lemons, pink, green and black olives, bright red harissa of extraordinary fieriness, khlee (confit beef) and a delicious green olive tapenade which we tasted in great spoonfuls. 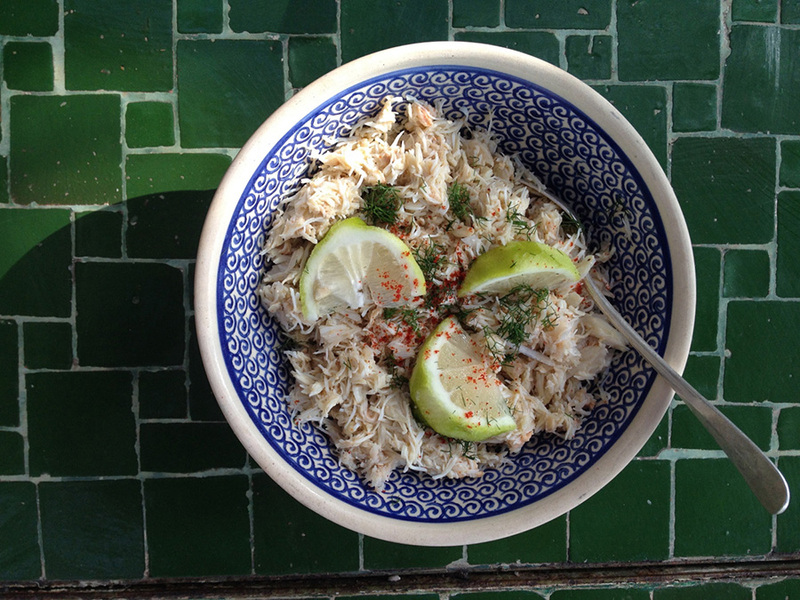 As our bags filled with shopping, inspiration for dinner took its course. 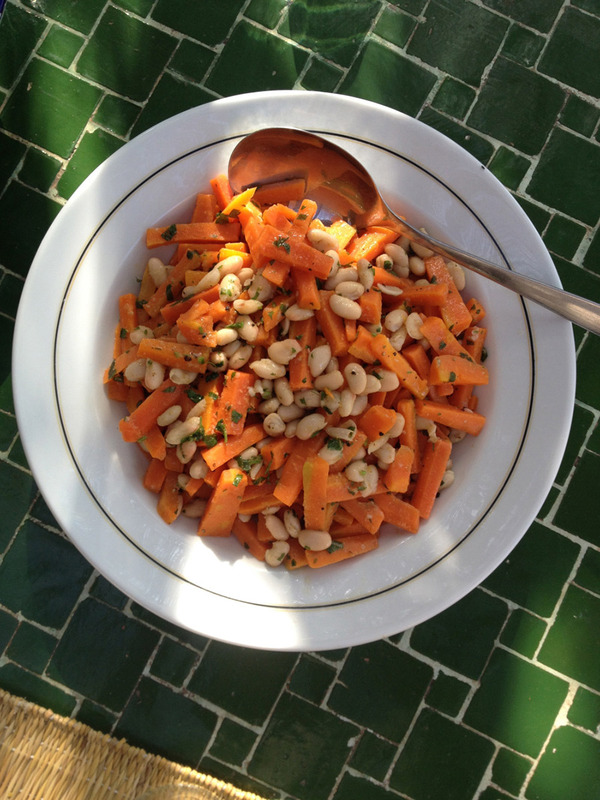 Back in the riad kitchen, we got to work. I marinated the chicken in coriander, cumin and preserved lemons; roasted the potatoes with harissa and braised the carrots with onions and ground coriander seeds. Our hostess made a salad of bulgur wheat, herbs and pomegranate and for pudding I made an almond cake with orange flower water and lemon syrup, which we served with mint tea and pistachio nougat from the souk. After a few days of celebrations, cooking, eating and shopping in the city, it was time to escape to the coast for New Year. 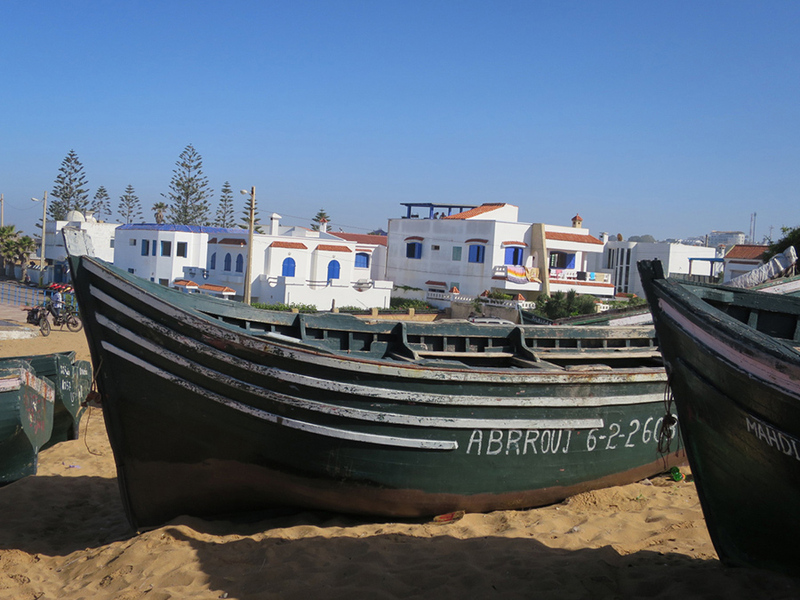 Three hours drive north west of Marrakech is the seaside town of Oualidia. 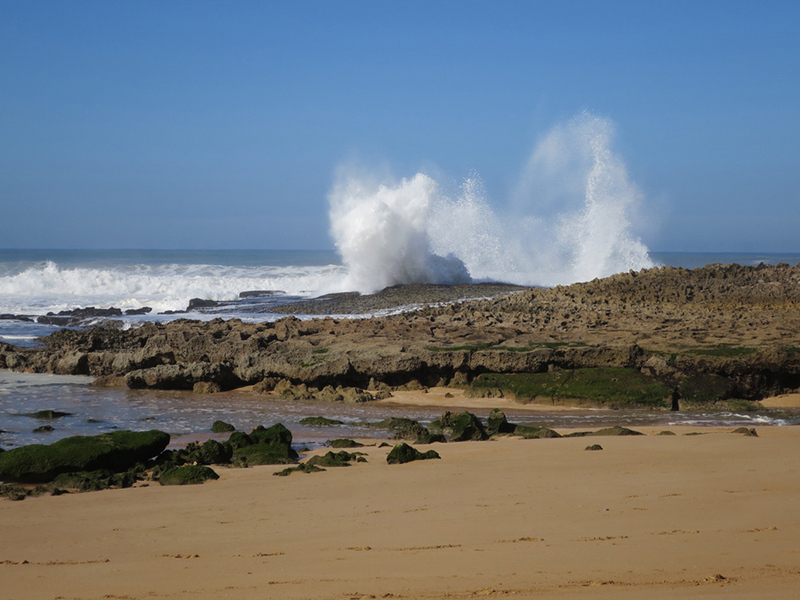 In the summer months the town is full of Moroccans fleeing from the city in search of the cool sea breeze. 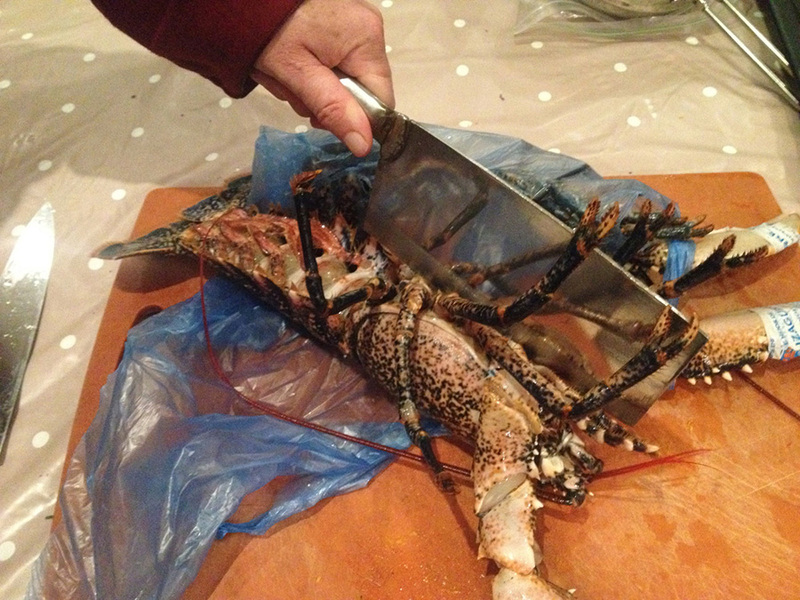 At this time of year, just the farmers, fishermen and a few stray holidaymakers remain. 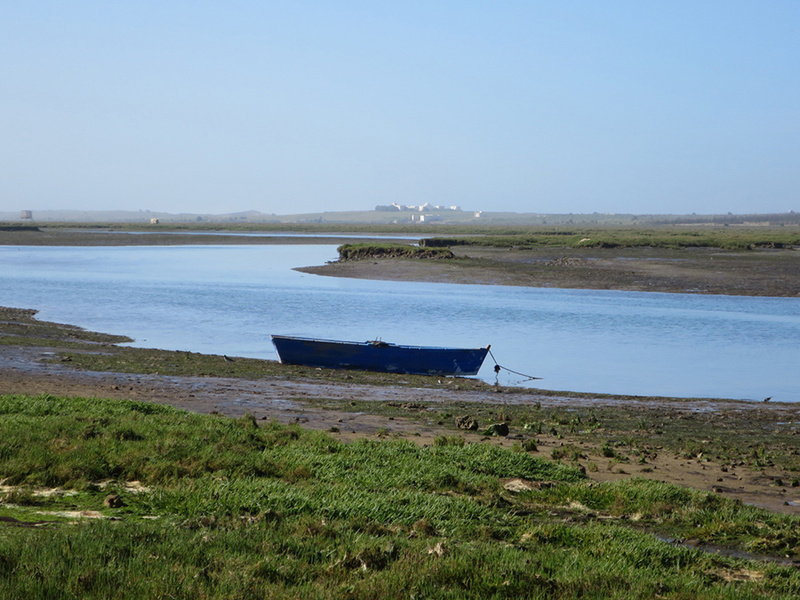 Oualidia is famous for its seafood, surfing and huge saltwater lagoon. The lagoon lies along several miles of coastline, protected from the crashing Atlantic waves by a long stretch of rocky cliffs. Gaps in the rocks allow the seawater to flow into the lagoon, so the water levels rise and fall with the tide. At low tide, fishermen wade out to gather clams and baskets of oysters, which can be bought by the piece from sellers on the sand, to eat in your fingers, sucking the sea juice from the shells. 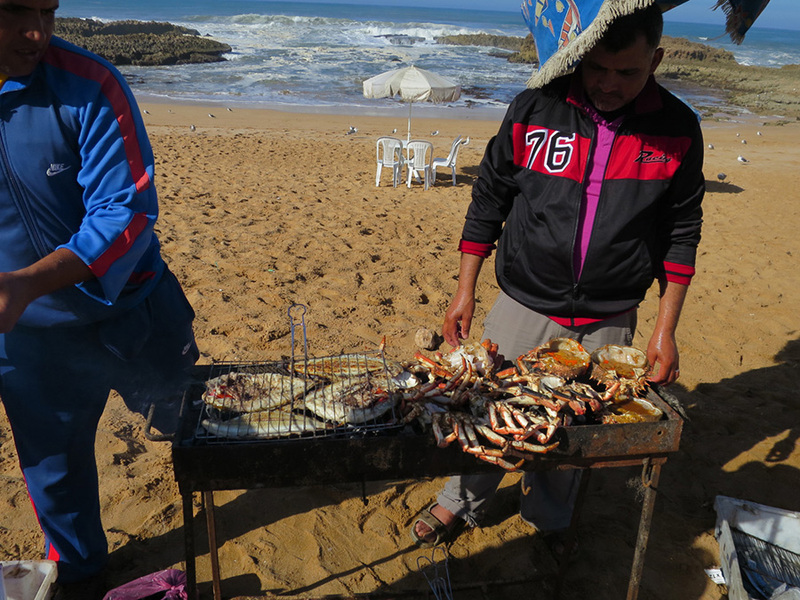 Men on the beach sell freshly grilled fish, which they’ve cooked on small charcoal barbeques. We bought a sole straight off the fire and ate it standing there, tearing pieces of succulent flesh from the bones with our hands. The house where we stayed stood just above the lagoon. 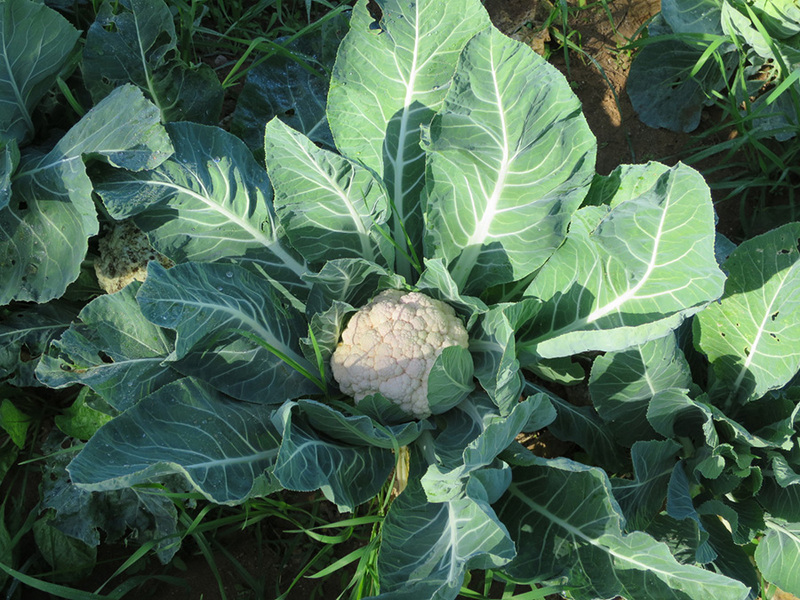 Leading down to the water was a large strip of land that had been made into a vegetable garden where beetroots, cauliflowers, courgettes, salads, thrived in the winter sun. At the top of the garden was a hen coup that provided fresh eggs for breakfast, which we ate soft boiled with homemade bread. Honey came from the house’s hives. 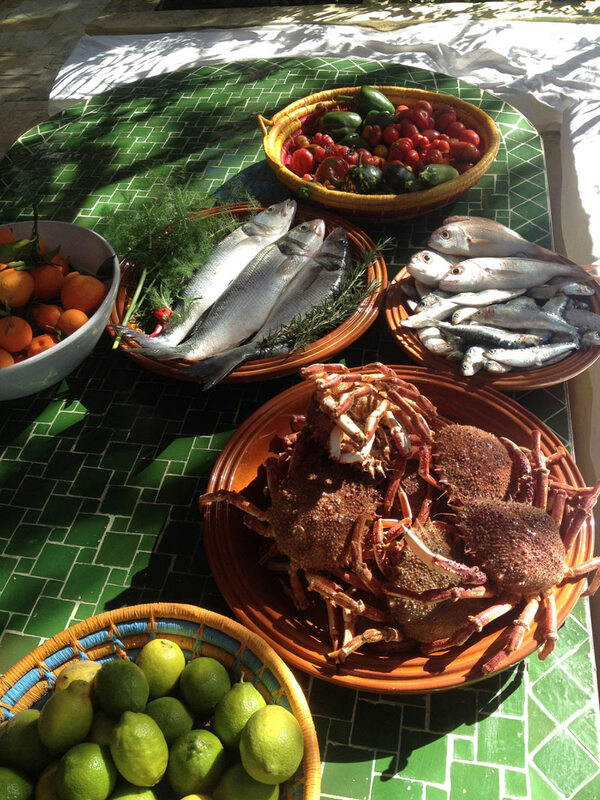 Most abundant of all was the fish: we made daily trips to buy sea bass, spider crabs, sole, oysters, lobsters and cuttlefish directly from the fisherman. 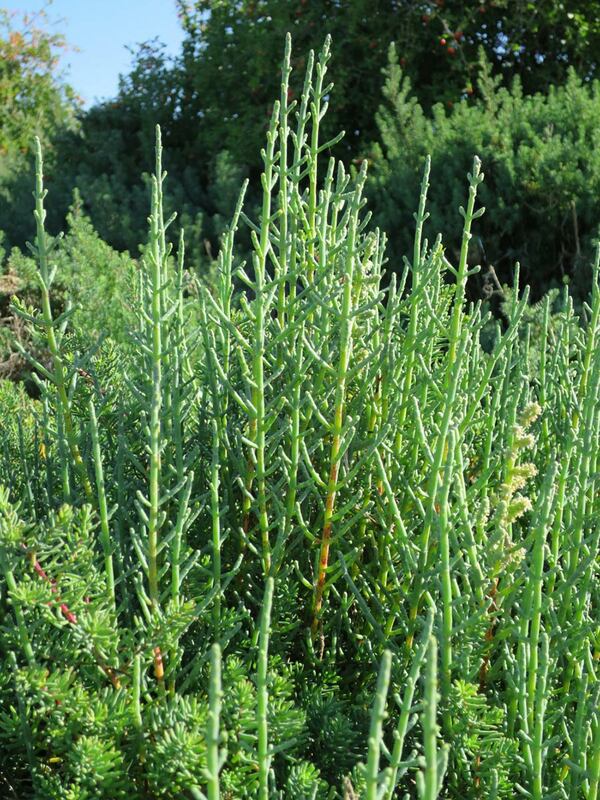 Cooked simply and accompanied by samphire we picked that grew all along the shoreline. 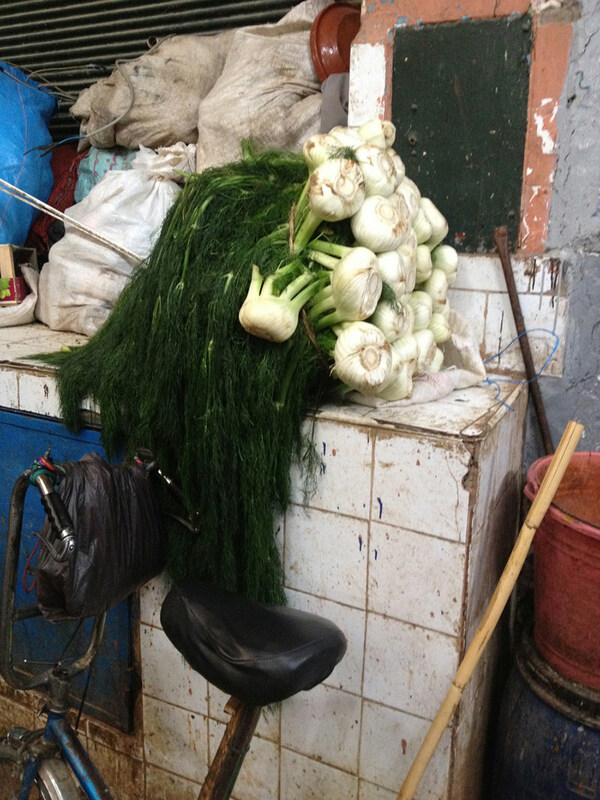 When we weren’t cooking and eating at home, we visited the local market to shop and eat. Some stallholders had barbecues where they grilled skewers of meat over hot coals; others displayed rows of tagine pots, the steam escaping as they lifted the lids to show the contents cooking inside. 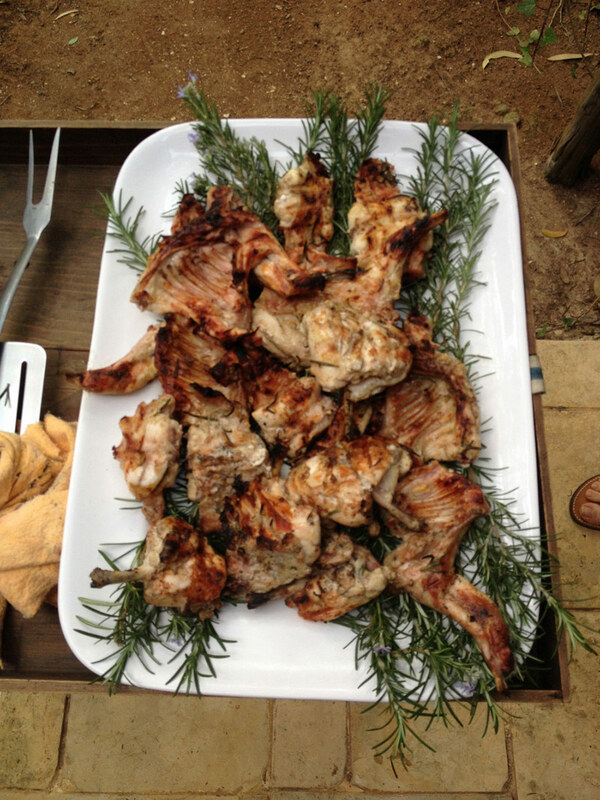 We bought skewers of spice rubbed chicken, which were stuffed inside soft bread with chopped sweet onion and herbs. One stall had a vat of oil in which they fried doughnut like pastries. We watched as the wet white dough was dexterously shaped into rings and dropped into the boiling fat to swell and turn golden. 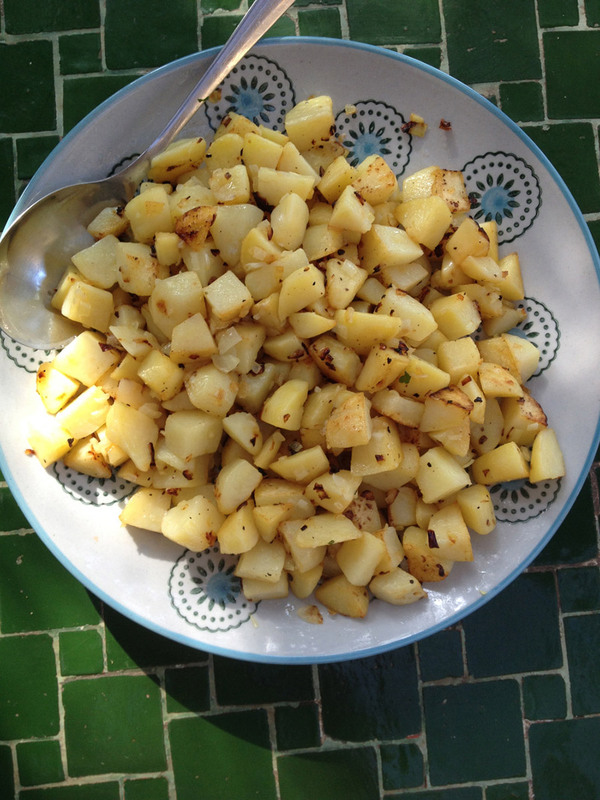 These we carried home in a paper bag to sprinkle with sugar and cinnamon while they were still hot. 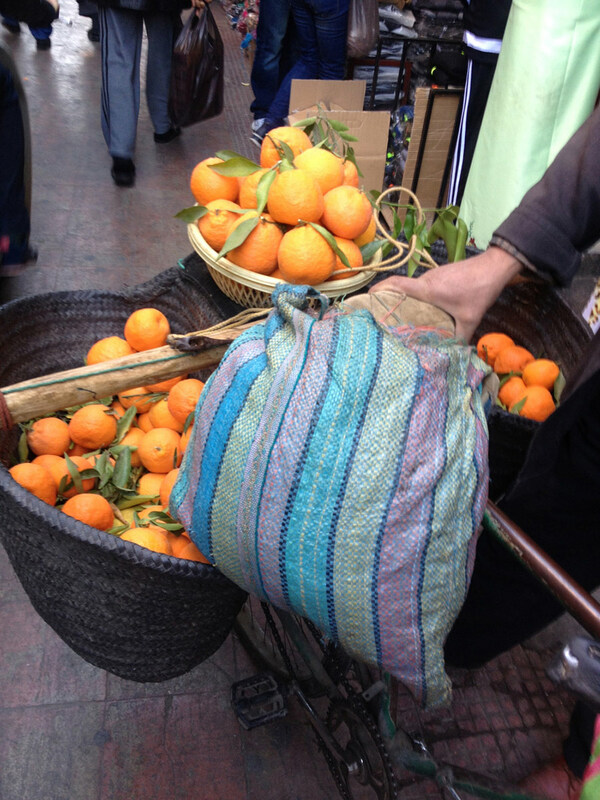 There were wooded carts piled high with clementines, the fruit squeezed to order. 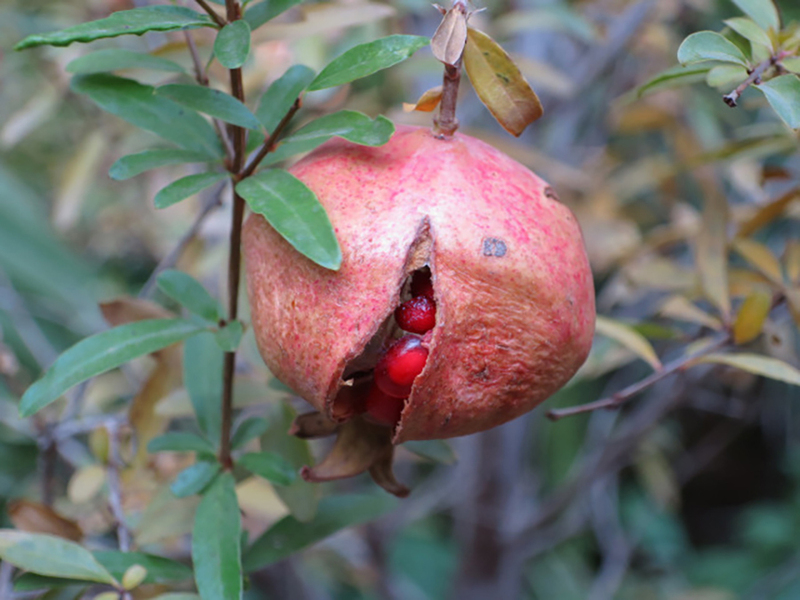 I drank a glass of the sweet juice, aromatic with the oils from the sun soaked skin. 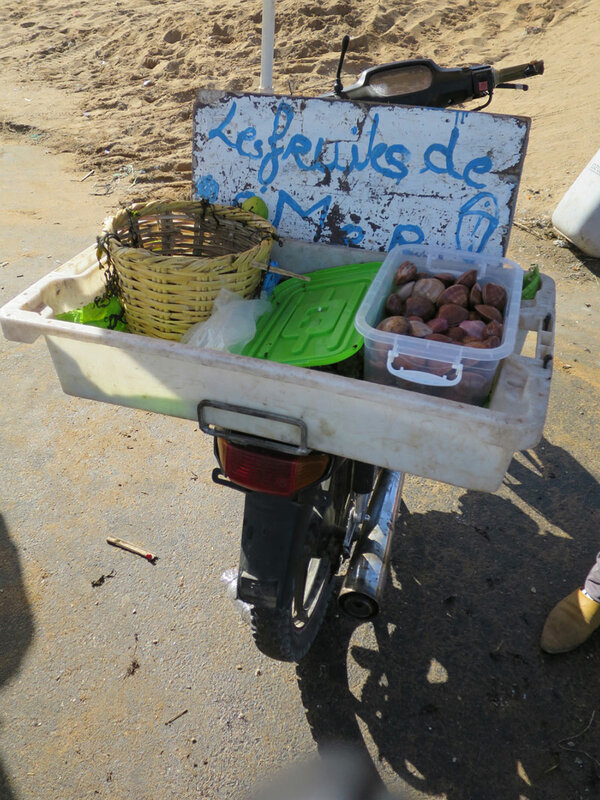 Others carts were laden with olives, spices, vegetables and nuts. Sellers of bright wools and woven blankets, baskets and metal hardware had laid their goods on blankets on the ground and one meat seller had butchered a whole sheep that he displayed on his wooden slab, every organ and joint neatly laid out. 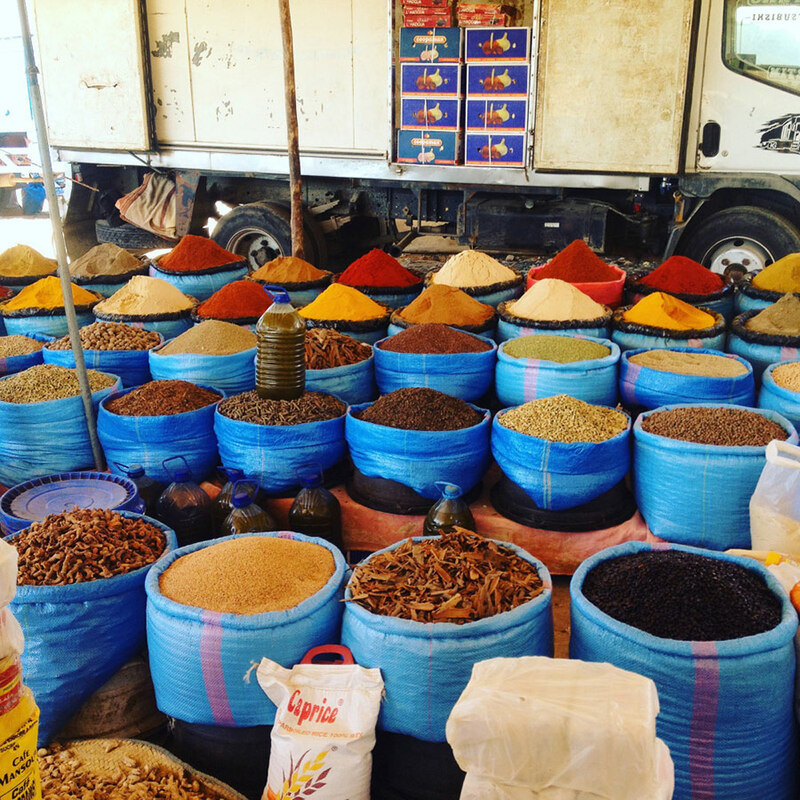 I stood in the market place, amongst the colours and the smells, the abundance and variation, and I felt the inspiration that only comes from discovering things first hand: the raw ingredients that provide this nation with one of the greatest cuisines.